MOSCOW (Sputnik) - Head of the RIA Novosti Ukraine news portal Kirill Vyshinsky, who was detained in Kiev on Tuesday, absolutely needs his medication in order to manage his health problems while in custody, his wife, Irina, said. "I know absolutely nothing. Moreover, I am very concerned over the fact that my husband has some health problems, and these are quite serious problems. He cannot manage without his medication," Irina Vyshinskaya told Russia’s Channel One. Vyshinsky was detained on charges of treason on Tuesday. 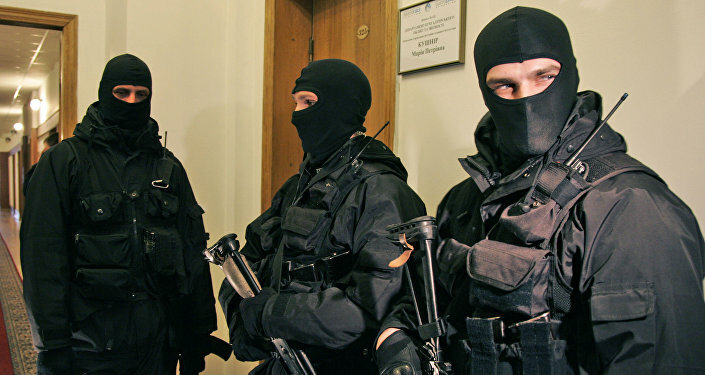 That the same day, the Ukrainian Security Service (SBU) broke into the office of RIA Novosti Ukraine in Kiev and the homes of two other journalists. Earlier on Wednesday, Vyshinsky’s lawyer said that the authorities began the prison transfer of the journalist from Kiev to Kherson, where they will determine a measure of restraint for him. Rossiya Segodnya Director General Dmitry Kiselev demanded that the Ukrainian authorities free Vyshinsky immediately and end their persecution of the media. Margarita Simonyan, the editor-in-chief of the Sputnik news agency, stated that she thought what was happening in Ukraine was Kiev’s "revenge" for the recently opened Crimea Bridge. She further noted that RIA Novosti Ukraine was not legally linked to Rossiya Segodnya, but was its media partner. Kremlin spokesman Dmitry Peskov, in turn, has said that Russia would take reciprocal measures in response to Kiev's actions but needed more detailed information. Peskov noted that the Kremlin strongly condemned the use of force against Russian media in Ukraine and expected a harsh reaction from international organizations to Kiev’s hostile actions. The Russian Foreign Ministry has called on the Organization for Security and Co-operation in Europe (OSCE) member states and the European Union, as well as other international organizations, to condemn Kiev's policy against the media. Meanwhile, Russian Foreign Minister Sergei Lavrov has said that Kiev’s actions against the RIA Novosti journalists were unacceptable. The Russian embassy has sent a note of protest to Ukraine demanding that Kiev halt its persecution of media representatives. Kiev has repeatedly limited the activities of Russian news outlets and journalists in Ukraine. In March 2015, Kiev published a list of 115 Russian media outlets, which could be denied or temporarily suspended accreditation by Ukrainian authorities as the outlets "posed threats" to national security. As the regulation came into force, a number of Russian journalists and television reporters were denied entry to Ukraine or deported to Russia.